Test the market for a modern efficient wood-burning stove along with sustainably-harvested firewood in Lusaka’s low-income townships. Zambia is a landlocked country of 14.6 million in Southern Africa that has a large and rapidly growing urban population: 39% of Zambians live in cities, and their numbers are increasing by more than 4% a year. In Lusaka, the nation’s capital and largest city, nearly 60% of the 1.8 million inhabitants rely on charcoal as their primary cooking fuel, and the poorest third of residents typically spend between 20-40% of their household income on charcoal. In addition, many households that own electric stoves opt to cook with charcoal instead, in order to avoid high utility costs. Charcoal production currently accounts for as much as ¼ of annual deforestation in Zambia--a toll that is likely to climb rapidly in the coming years as the pace of urbanization increases. Loading charcoal for transport to Lusaka market. In June 2014, Global Hearthworks launched a pilot project in Lusaka, Zambia to test the market for a modern efficient wood-burning stove in combination with sustainably-harvested firewood. Operating under the trade name, Nkuni FastFire, the project targeted low-income households in the city’s charcoal-dominated townships, where residents can spend more 1/3 of their monthly income on cooking fuel. The aim was to distribute 2000 EzyStove™ (an imported, low-cost award-winning “rocket stove”) through a network of neighborhood micro-vendors and build demand for our branded, eco-friendly wood fuel as an affordable and efficient alternative to charcoal. During the pilot phase, the project sourced firewood from a number of managed woodlands on large farms close to the city. Local women (the unemployed wives of farm workers) were trained and employed to harvest stickwood using pruning and coppicing techniques. If the market proved viable, the project would provide agroforestry training to smallholder farmers located within 100km of Lusaka enabling them to become the primary providers of wood fuel to urban consumers. By early 2015 it became clear that stove sales were moving slower than hoped and, despite a well-organized effort to harvest and pack tens of thousands of bags of sustainably-sourced firewood before the rains arrived, demand for the fuel had not materialized. In subsequent months, stove sales improved but wood sales remained flat, indicating that few EzyStove owners were interested in purchasing wood once their initial bag (provided at the time of stove purchase) had run out. In June, one year after launch, Global HearthWorks concluded that the market test had proved negative and decided to close down the pilot. A number of factors contributed to the Lusaka project’s failure, the most significant of which are worth describing briefly as they may offer useful lessons for similar endeavors in the household energy space. The low purchasing power of our target households meant that we had to sell the EzyStoves at or below cost ($10-$15), making the business model entirely dependent on projected sales of firewood. Our costs for harvesting, packing, transporting and storing the wood fuel had to be low enough to allow us to earn a small margin on sales to urban vendors, while keeping the price well below the price of an equivalent bag of charcoal. Though the numbers looked plausible on paper before launch (assuming that volumes of sales would compound rapidly in the first 2-3 years), they proved unrealistic once the project got underway. Rising fuel prices and an increase in the minimum wage rate, under a newly elected Zambian government, pushed transport and labor costs well above the model’s assumptions. The social impact potential of the project convinced us to proceed despite these financial red flags; as long as charcoal prices continued to rise, we reasoned, we should still have a competitive advantage, and we would keep working on ways to reduce our overhead costs. This reasoning presupposed a growing demand for our wood fuel from customers who were experiencing the benefits of the EzyStoves. New stove-owner in Chipata township. So why didn’t demand for wood fuel take off as expected? Assumptions about the economic behavior of our target customers led us to overlook the importance of some very basic perceptions about fuel. 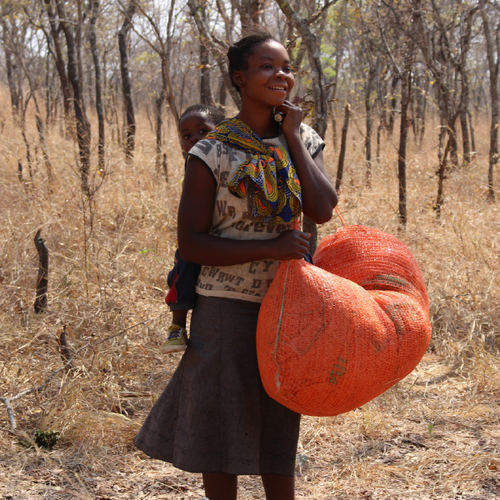 While we wisely focused on fuel savings in marketing our stove to women in low-income Lusaka neighborhoods (rather than emphasizing health or climate benefits which few can afford to prioritize), we failed to appreciate that women don’t view wood as a commodity the way they view charcoal. Because firewood is the primary cooking fuel for rural Zambians (the majority of whom freely collect it from nearby forest areas), urban residents widely regard it as a free fuel, appropriate for only the poorest people. Thus, while the EzyStove clearly presented a higher quality, more modern alternative to the common charcoal brazier, most of those who purchased the stove, we later learned, assumed they would find wood around their houses once the initial bag ran out. Few if any of our customers likely planned to use the EzyStove as their sole cooking device; rather they viewed it as supplemental to their charcoal stove. Many also purchased the stove for relatives in the countryside who could clearly benefit from its efficiency compared to a three-stone fire. As one of our stove retailers explained after the project closed: “The stove is good but many people in this neighborhood thought it was meant for ‘vulnerable people’ [orphans, widows, or displaced families]…”—that is, people who rely on donations and have no alternatives to wood fuel. Despite extensive demonstrations showing that our woodstove cooks the staple Zambian dishes faster and with less fuel than the typical charcoal stove, the perception of wood as a free resource rather than a modern product worth paying for deterred many of our would-be customers from investing in making the switch. Cooking solutions, even for those living in squalid urban conditions and struggling to get by on a few dollars a week, have to make sense in cultural and aspirational terms, as well as in economic terms. New harvester arriving with firewood bags. Unfortunately the history of cookstove interventions over the past few decades includes far more stories of failure than success. Efforts continue because the problem is so urgent and enormous, but each new initiative needs to take into account the failed attempts that preceded it—not only in order to avoid making the same mistakes, but also to recognize the impressions and expectations left behind. We launched the Lusaka pilot in the immediate wake of a large, well-financed German project that sought to distribute tens of thousands of improved biomass cookstoves as a carbon offset vehicle under the Clean Development Mechanism. Funded by the German energy company, RWE Power AG, “The CDM Lusaka Sustainable Energy Project” introduced more than 27,000 low-income households to the Save80 Cooking System—a stainless steel stove with an 8 liters pot and an accompanying heat retaining device, known as a Wonderbox—that used sustainably harvested twigs (from Pigeon Pea trees grown by farmers outside the city) in lieu of charcoal. The cost of each stove with accessories—100 Euros (in 2011)—fell far outside the budget of the intended users; yet because each registered stove would generate valuable carbon credits (based on projected GHG emissions reductions, when the price of CO2/ton was still high), project implementers could afford to distribute the stoves on a loose, very long-term, monthly installment plan. As a result, customers paid next to nothing for the gleaming new appliance. Many people sold them or gave them away as gifts to relatives, and few users purchased the project’s twigs on a regular basis (in fact, rumors spread that the stove worked very well with charcoal despite warnings that charcoal would damage the interior!). The local agents, mostly women who worked on a commission basis for the project, eventually became debt collectors, accumulating fees from thousands of clients, long after the project funders had pulled out. The impressive scale achieved by the Save80 project confirmed the high demand in Lusaka for an alternative cooking system; but the program’s mismanagement encouraged theft and corruption and ultimately tainted the market for subsequent cookstove enterprises. It was difficult to sell the far more modestly-priced EzyStove at cost in communities where people had come to associate improved stoves and sustainable fuels with elaborate giveaway schemes. (We were frequently asked why our stove didn’t include free cooking pots and a “Wonderbox”.) There was also an expectation that customers could drag out their payment installments indefinitely despite the agreed upon terms of sale. In retrospect, greater due diligence on the causes of the Save80 project’s demise would have deterred us from launching our pilot in the same vicinity of the city, even though we believed our product and business model were more suitable to the low-income families who live there. As it turned out, a number of the people we hired for the pilot had some involvement with the previous project—a fact that seemed an advantage at the start because of their relevant experience and knowledge, but ultimately proved problematic in cases where earlier monetary entanglements, loyalties and resentments persisted, affecting job performance as well as the community’s perception of our enterprise. Our most significant error, though, was a failure to heed the key lesson from the Save80 project: namely, that stove users didn’t feel the need to purchase the sustainably harvested twigs on a regular basis (leaving farmers with hundreds of bags of pigeon pea twigs rotting in the sun); instead, we mistakenly believed that our customers would value our wood (which is much denser than the Save80 twigs and more difficult to acquire freely in sufficient quantities) as a product commensurate with charcoal. Again, this was a case of our missing the cultural and lifestyle preferences of our target customers by assuming that efficiency, cost, and convenience were the sole determining drivers of fuel choice.